This book is an instant source of nearly 200 carefully chosen model speeches you can use to add spice, impact, humor, and clarity to your next speech or presentation. This remarkable resource includes word-for-word speeches covering 65 different business situations, … from anniversaries and dedications, … to leadership inspiration, … from sales motivation and quality control, … to cutting expenses and increasing productivity. Just scan the table of contents, choose an appropriate speech topic, and then personalize it with the tips for making the speech your own. All are ready-to-deliver for any occasion. 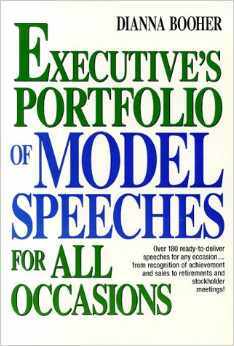 Communicate like a pro with Executive’s Portfolio Of Model Speeches for All Occasions!